Enjoy the warmth and friendly atmosphere of this one of a kind historic property. 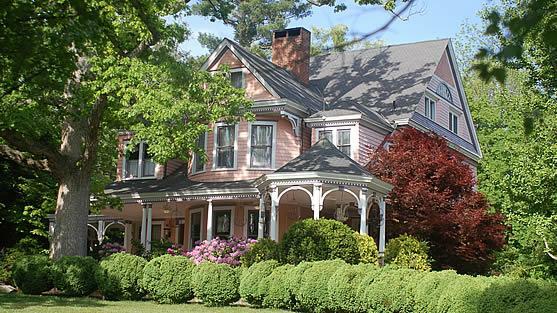 Built in 1894, this historic home has been meticulously restored as a romantic bed and breakfast, with an air of casual luxury and elegance, the perfect environment for an exceptional getaway experience. Listed on the National Register of Historic Places, this beautiful Queen Anne Victorian is situated on 1 1/2 acres in the quiet, residential Chestnut Historic District. It provides an oasis of beautifully landscaped grounds, gardens, and waterfalls just a half mile stroll from the vibrant activities of downtown Asheville, NC. It was once the home to actor Charlton Heston and his wife, Lydia, who would walk downtown to their work at The Asheville Community Theatre, which is still putting on great plays throughout the year.